According to a new study by Transparency Market Research (TMR), the global automotive lubricants market exhibits a high degree of competition and is likely to increase with the entry of new players in the near future. The top three players, namely ExxonMobil Corp., Royal Dutch Shell PLC, and BP PLC, accounted for 31.6% of the overall market in 2015, indicating at highly fragmented nature of the market. “The dominance of these players can be attributed to their diversified product portfolio and robust distribution channels,” says TMR’s lead analyst. 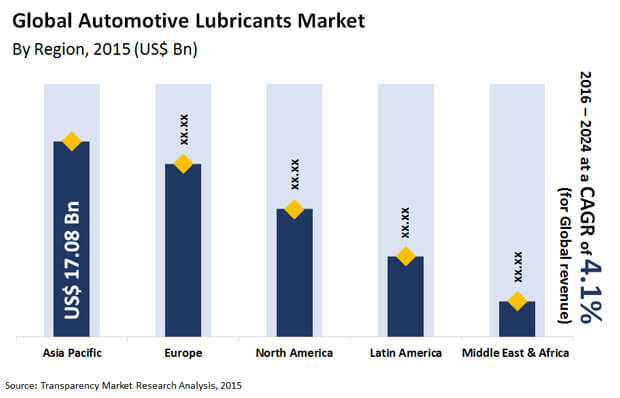 The global automotive lubricants market had a valuation of US$55.44 bn in 2015 and is poised to rise to US$78.92 bn by the end of 2024. Between 2016 and 2024, the market is expected to progress at a CAGR of 4.10%. On the basis of vehicle type, passenger vehicles will continue to dominate the market in terms of volume until 2024, with sales over 32.3 mn tons by that year. The expanding base of affluent consumers is translating into the greater purchase of passenger vehicles, driving the demand for automobile lubricants. Geographically, Asia Pacific will continue to be the leading market for automotive lubricants in terms of value until 2024. The increasing purchasing power of consumers along with strengthening economic conditions is one of the primary reasons behind the dominance of the region. China and Japan are among the leading consumers of automotive lubricants, owing to the robust growth of the automotive sector in the countries. Owing to these factors, the region is anticipated to exhibit a CAGR of 5.40% during the forecast period. With the rising sales of motor vehicles, the demand for automotive lubricants is expected to follow a notable growth trajectory. “Since automotive lubricants enhance the operation and lifespan of vehicles, by protecting their engine against friction, their demand is directly influenced by the number of automobiles on the road,” says a TMR analyst. In addition, the growing global population is translating into the higher requirements of vehicles to meet the transportation needs of people across the globe. Besides this, the increasing purchasing power of consumers is reflecting positively on the sales of motor vehicles, which in turn, is providing a significant boost to the global demand for automotive lubricants. Despite an array of drivers, the high costs of fully- or semi-synthetic lubricants are adversely affecting the growth of the global automotive lubricants market. Moreover, the rising enforcement of stringent regulations and norms on emissions caused due to fuel and lubricants, particularly in developed regions, is likely to deter the pace of development of the overall market. This, coupled with the growing trend of using biofuels in motor vehicles, is impacting the growth of the market negatively. However, the flourishing growth of the automotive sector in emerging economies is opening new growth avenues for market players.